Happy Friday, all. I hope you’ve been having a good week! Robin Hood and I have been up to a hodge-podge of things. Last Saturday, we had a staycation, of sorts. 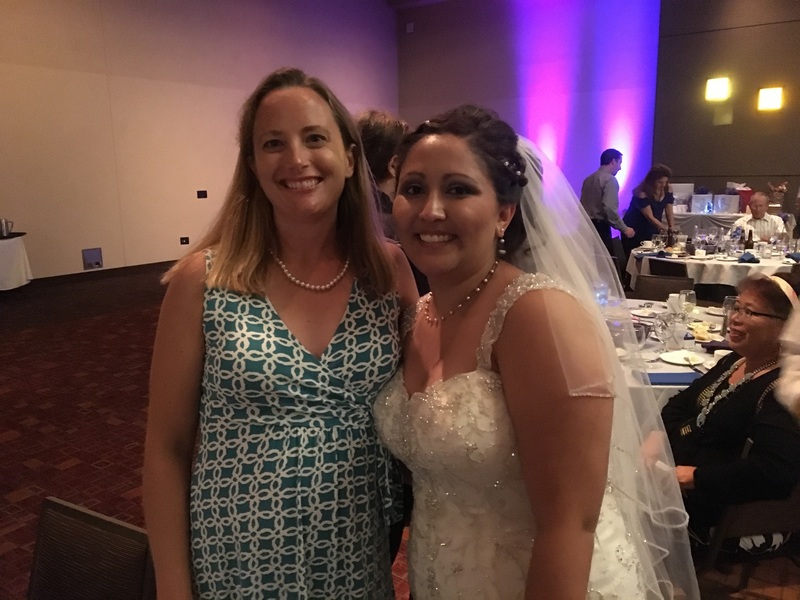 Two friends of ours got married, and the venue (Isleta Resort & Casino) was juuust far enough away to make it worth our while to stay overnight. 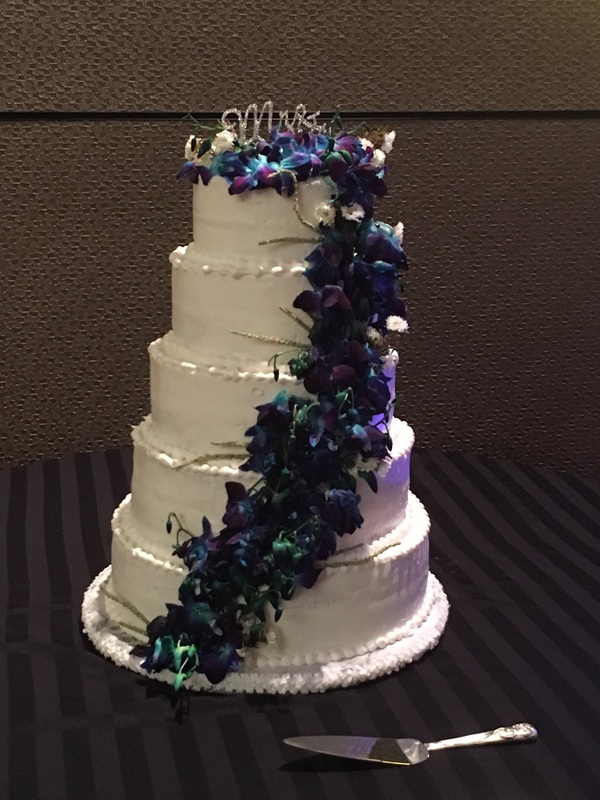 I also snagged the cake for a photo. Hey, it was pretty. I got tired and had to go to bed at what seemed like a depressingly early hour, but such is life these days. Robin Hood tells me that good times were had by all. But! The cool thing about staying overnight at a wedding venue, and not drinking during the festivities, is that you can get up early to take advantage of the hotel fitness center. Helloooo respite from the heat outside! I hopped on the elliptical machine and…proceeded to have my rear end handed to me. Sure, it’s lower impact than a treadmill or running outside, but that doesn’t mean it’s easy. Oh well. It still gave me much-appreciated workout variety. Speaking of workouts, I’m holding steady at two yoga classes per week (a lifetime best!) and still trying to run consistently-ish. I won’t lie, it’s not getting any easier to run in the afternoon these days — the monsoon season I gushed about recently has been MADDENINGLY erratic — and sometimes I opt for a walk of comparable distance instead. It’s better than just hanging out on the couch every day, right? I’m not starting my sabbatical from running yet, though. My goal is to complete at least one more 5k before this baby comes, and right now, that is still reasonable. Hooray for staying active! Meanwhile, Robin Hood’s been getting ready for – you guessed it – a hunt. A BIG hunt, for elk, next month. It’s an archery hunt, so no guns allowed, and he adds to the fun/challenge by wielding a traditional bow, rather than a compound. It’s been a long-time goal of his to get an elk this way, so say some prayers and cross your fingers for him! Anyway, he’s been preparing for it, which means gear and tools are, ahem, “arranged” in various places around the house, which keeps me on my toes. Sometimes literally. But I do benefit from the fact that preparation includes the preparing of food. We’re trying to make a few casseroles ahead of the hunt to be frozen and then easily reheated once he’s out in the wilderness, and thus far they’ve been VERY tasty. What, you think we don’t do quality checks?? 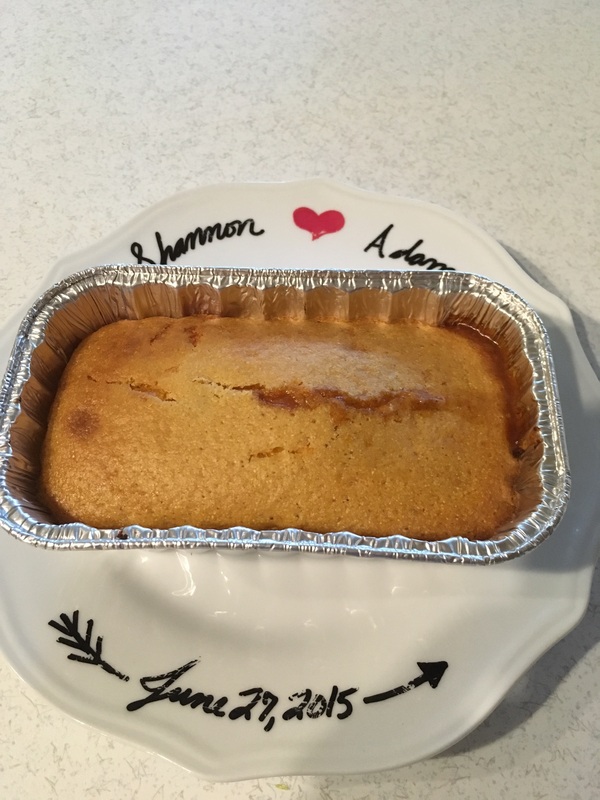 This past week we made chili cornbread casserole. It’s exactly what it sounds like: chili, topped with shredded cheddar, topped with cornbread, then baked, then devoured. You may have already seen this if you follow me on Instagram, but I’m posting it again here, because just looking at it makes me happy. Anyone have a go-to, make-ahead camping meal, or good hot-weather workout they’re willing to share? Next Post Be Gracious To Yourself. Good luck to Robin Hood. An elk with a bow. I like a man who likes a challenge!